Twitter has updated its official mobile app on iOS and Android with features that should make it easier for users to discover new content. The most major addition comes from the Discover tab, which now consolidates tweets, activity, trends, and suggested users to follow in a single timeline, which sounds useful and not overly cluttered at all. To bring a little more clarity to the Discover tab there are also now previews for user activity and trends at the top of the tab, which users can tap to see those lists independently. Users can also now click on URL links in tweets directly from the timeline, rather than going through the extra step of expanding a tweet before opening links. Continuing the theme of consolidating features, the search option has also been updated to now return search results for tweets, photos, and user accounts in a single stream similar to the Discover tab. 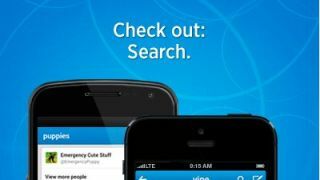 Search offers a bonus treat for iPhone users with the latest update, offering a persistent search icon next to the compose tweet button at the top of the app. The search button was already part of the Android and iPad Twitter apps, but Twitter has seen fit to let the iPhone app catch up with the other versions. The Connect tab is the last update recipient, now showing all interactions including new followers, mentions, and retweets in a single stream by default. However, users will still have the option to change the Connect tab to only show mentions in the app settings. Twitter's latest mobile update pack more features into each tab to make it much easier to find new content, but it may consolidate things too much so that it is harder to find the content you are actually looking for in the shuffle.